for 6 weeks for Junior Primary students in foundation to year 2.
and enter the code rdaad. There is no cost to register or to participate. Places are limited to 50 so first registrations in will be able to participate. Students can wear their sports uniform on the day. They are not required to wear football boots - normal trainers or runners are fine. 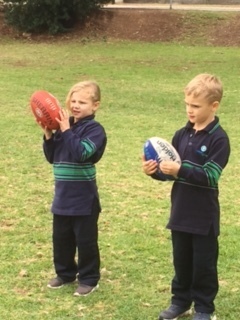 Please ensure your child has a water bottle they can refill from the school taps before the footy clinic starts. If the weather is really bad we will contact you via email early that day to clarify if the footy clinic can go ahead or not. We will also require a few parent volunteers to help with the Footy Skills. Please let the Jenny in the office (jennyj@ilsg.sa.eu) or Richie Cochrane (PE Teacher) richiec@ilsg.sa.edu.au know if you are able to help.